Helping kids get ready for the task of eating by moving their bodies helps them be more prepared for eating a wider range of foods. 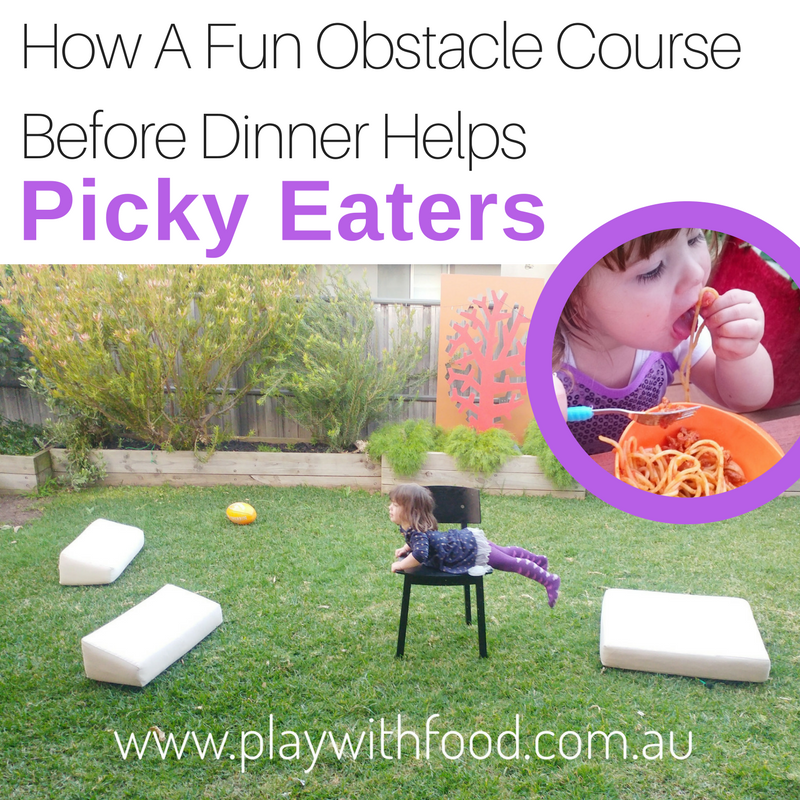 This parent hack on building an impromptu kids obstacle course is perfect for helping picky eaters try new vegetables. It is also a great way to shake off the day’s activities and have some time together. It sets the mood for a positive meal together. Moving our bodies (even if it is just a wiggle, stretch and shake before breakfast) is an important feature of our family meals. I often incorporate it into our handwashing routine too. 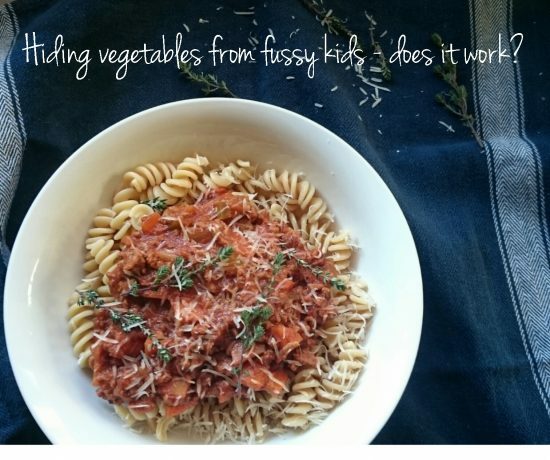 If you have a picky eater or a child fussy about vegetables or meat, this post is for you! 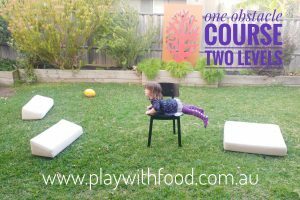 Last week we set up a VERY simple back yard obstacle course and I thought it was a great opportunity to snap a picture and explain just how simple it has to be. You don’t need expensive equipment to make moving your body part of your getting ready to eat routine! You may have some “equipment” already sitting there under your nose. About 5 years ago we set out on a family day trip to go and buy an outdoor lounge we’d been eyeing off online for ages. It was located in a trendy inner city suburb and we were going to make a morning of it with a cafe brunch. We loved the modular lounge. I envisaged comfortably laying back on the lounge and watching my little girl play quietly next to me whilst I enjoyed reading a book. It was a great little dream! Fast forward 5 years and exactly zero books have been comfortably read on said lounge. The modular design has helped increase my exercise though! I am constantly doing lunges and squats as I run around picking up all of the cushions that “need” to be removed in order to make a cubby house. However, all is not lost, I love using the cushions to create pre-mealtime obstacle courses. I mean they are scattered all over the place anyway. Why not? You can use large square cushions to do star jumps on, run around, do an “echidna” yoga pose (aka child’s pose) and tap your feet on the edges. You can use a chair to slide across like a snake (as pictured) or crawl under. You can use the skinny back rest cushions to walk over with your feet on either side or crawl over with your belly up high. You can jump over the cushion from one side to the other. Or with the addition of a ball, you can roll the ball along the top of the cushion. You can use the large square cushion to do bunny hops, forward rolls or mini-cartwheels. Or for the keen ones, try some burpees. You could jog up and down onto the cushion alternating which foot is the lead foot. You can use the chair to rest their hands on and do some balancing with one foot. Or to shimmy on their back underneath the chair. You can use the back rest cushions to crab walk over the top (trying not to touch the cushion with their back). Or to dribble-kick a ball around. The possibilities are endless and you can use a simple obstacle course for a variety of ages at the same time. I love it when the kids challenge eachother to different ways to use the same obstacle course. What do your kids like to do to move their body before dinner?